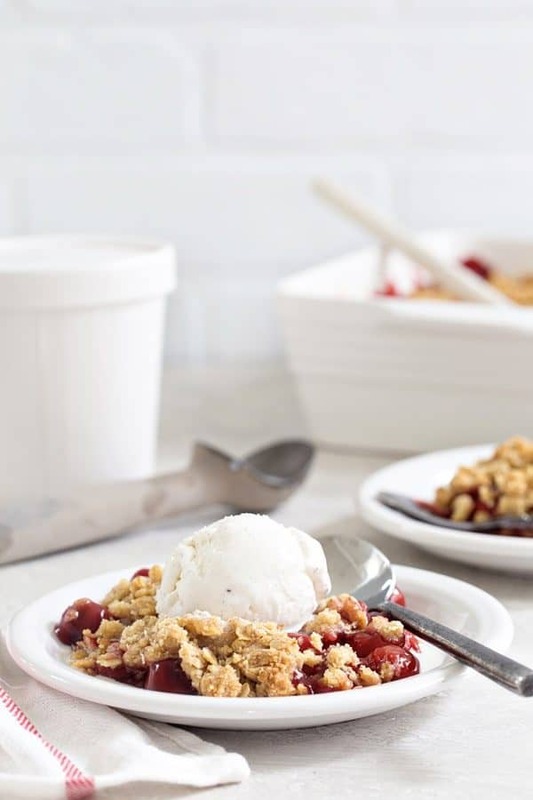 Cherry Crisp is simple, quick, and delicious. 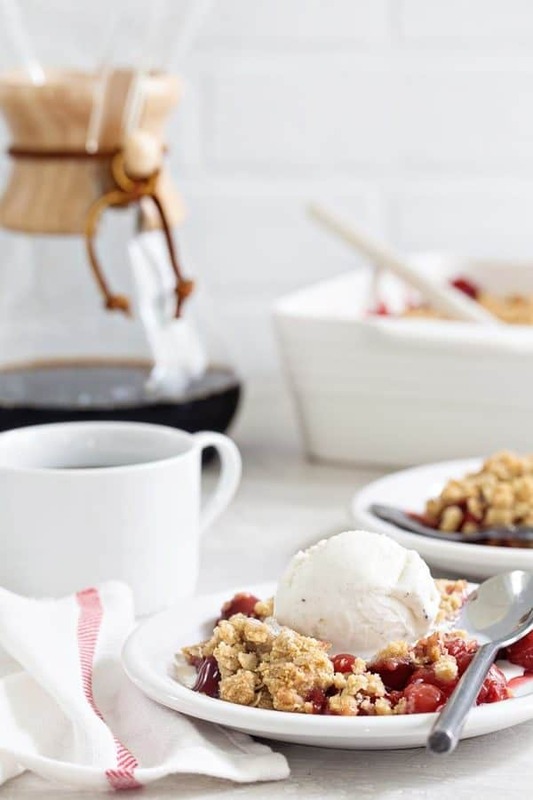 Top it with a scoop of vanilla ice cream for the ultimate weeknight dessert. Let’s talk about TV for second. I know most people dread the summer months because most shows don’t start rolling out new episodes until fall, but I kind of love it. You guys, I’m addicted to Big Brother and I’m not even embarrassed to admit it anymore. I’ll also own up to the fact that I was up until 2:30 am the other night because I was catching up on the houseguests’ antics by reading about their every move on a Big Brother app. Yes, I am officially that person. If you’re not familiar with Big Brother, let me explain. It’s a reality show on CBS that basically tosses 16 strangers into a house for the summer and films them 24 hours a day. And let me tell ya, they film them doing everything. If you’re watching, I need to know who your favorite is. Right now, I’m totally rooting for Kevin. I think he’s pretty slick (pun intended due to his hair) and I’m a fan of the fact that he clearly loves cardigan sweaters as much as I do. However, Cody’s camera stare-downs are giving me life right now. Since I just confessed my love of Big Brother, I might as well own up to the fact that I also love Teen Mom and MTV’s The Challenge. Judge away. There really is no correlation to Big Brother and this Cherry Crisp, except for the fact I enjoyed a warm bowl of it drenched in melty vanilla ice cream while watching it last week. 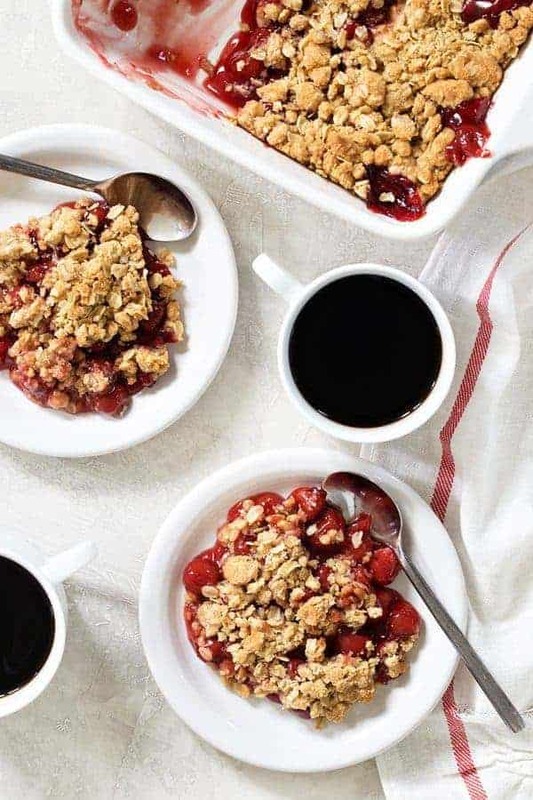 If you happened to catch my post for homemade cherry pie filling, you may remember that I’m pretty obsessed with cherries right now, so cherry crisp was naturally on my must-make list. I don’t know why I tend to equate crisps with fall because they are perfect any time of year – especially summer when they’re topped with cool, creamy vanilla bean ice cream. Think peaches, plums, blueberries, strawberries. You can pretty much crisp just about any fruit! 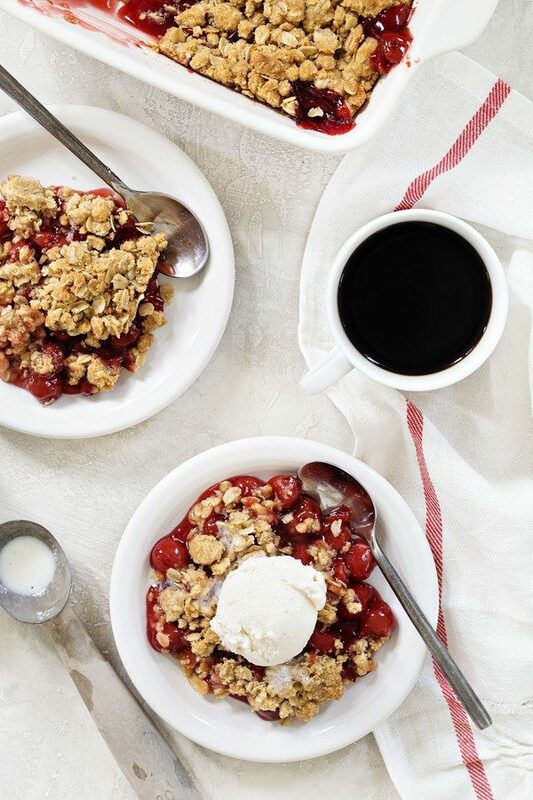 I used my homemade cherry pie filling for this crisp, but no one is going to judge you for pouring a couple of cans into a casserole dish and covering it in sweet, crunchy crisp topping. 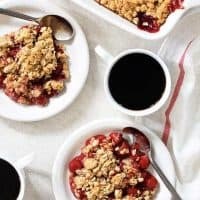 If you use canned cherry pie filling this dessert comes together in less than 10 minutes, which in my opinion, makes it the perfect weeknight dessert. Just add ice cream and your favorite reality show and you have a match made in television watching heaven. 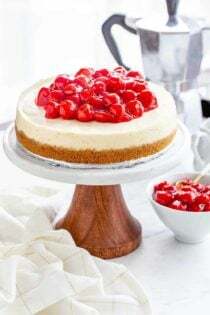 For more delicious cherry desserts, be sure to check out these Cherry Cheesecake Cookies and this Roasted Cherry Shortcake. 1 batch of homemade cherry pie filling, or 1 21-ounce can cherry pie filling. Pour cherry pie filling into the prepared dish. Stir together the flour, baking powder, baking soda, oats and brown sugar. Drizzle in the butter and mix until incorporated. Crumble mixture over cherry pie filling. If you don't like a lot of crisp topping, feel free to cut it in half. But personally, I feel like there is never too much crisp topping. That looks so delicious. I too have been on a cherry kick. I am an absolute Teen Mom junkie and I’m not ashamed. Thanks for stopping by – Teen Mom is getting a little crazy. I can’t wait to see how the Javie/Kail situation ends up. Thank you so much for posting this recipe. When I saw the picture of it in the Cherry Pie Filling post I really really really wanted to make it! I bought 3 lbs of cherries yesterday so I could make the pie filling and now that I have this recipe I can make the crisp too. It looks so yummy, I can’t wait to make it and then eat it! Great photos, too, by the way! Thanks so much for stopping by! I think you’ll really love the crisp. It’ so simple, but it tastes amazing. I totally agree, re: Paul. I was on his side until he orchestrated a bully fest. Not cool. I’m 100% rooting for Kevin at this point. I hope you loved the crisp recipe as much as we did! What a yummy recipe; we love Crisps or Crumbles with fresh fruit. Same here, Susan! Thanks so much for stopping by! Love anything with cherries or peaches!! And I love all the great recipes I’m finding and trying on my family. As for TV I have been a fan since day 1 of Big Brother, Survivor and The Amazing Race. Thanks so much for stopping by. Ya know, I’ve never watched Amazing Race and haven’t watched Survivor in years! I definitely love me some Big Brother though. I just got a new cherry pitter that does 7 at a time and this looks like just the recipe to use it for! I LOVE Big Brother and I love cherry desserts!! Nothing beats a classic! My hubs had a cheery tree growing up, and ate his weight in them. Now as an adult, having to pay for them, he wishes we had one, LOL! Also, I have that towel! Ha! 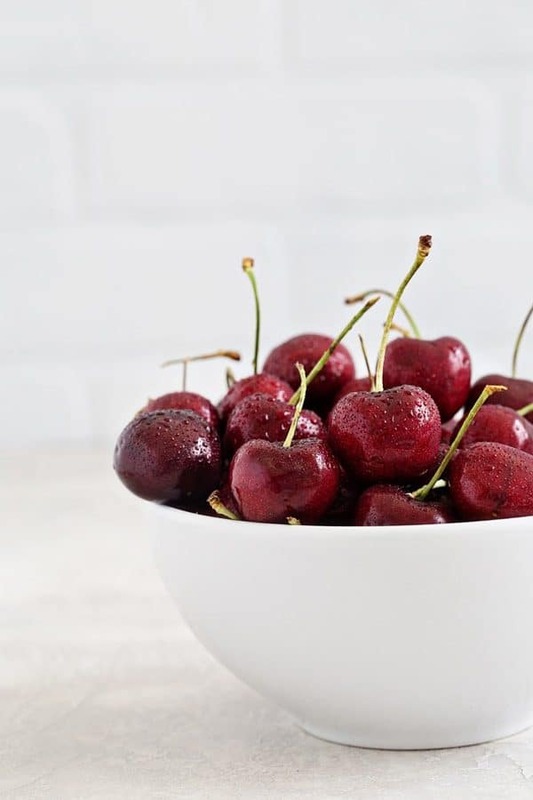 I love cherries and this looks so tasty. This is exactly what I was looking for! Next time I might add less brown sugar,but other than that it was perfect. Other recipes add cinnamon and nutmeg which makes no sense to me. I like the simplicity of this crumb and will be using it in the future. So happy to hear you enjoyed the crisp, Christine! Thanks so much for stopping by and leaving your feedback!